Home Uncategorized Free Frankincense Oil! For those of you who love doTERRA essential oils as much as we do, this month doTERRA are offering FREE bottles of Frankincense for wholesale and preferred member customers who place an order of at least 200PV. 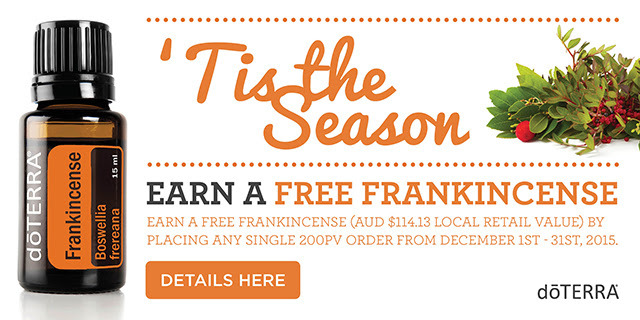 If you have bought a bottle of Frankincense from our centre you will know it retails for $114.15 so that is MASSIVE! If you would like to take advantage of this, please go to http://www.mydoterra.com/totallysoundhealth/ and click the “Join & Save” link. A keen musician with two science degrees, Simone Collins followed her heart to a career in natural health in 2003. Simone is the owner of Totally Sound Health, and is passionate about empowering others to take charge of their own health rather than becoming dependent on a therapist to fix them. Simone is also a mum to two beautiful girls.